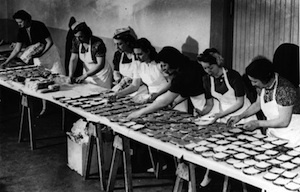 These days, food films and television shows are a dime a dozen, though most people and publications tend to focus on the big ones: Food, Inc.; Big Night; Ratatouille; Tampopo; the list goes on. Yes, the food styling is exquisite, the take-home message righteous, but the film geek in me has to know what lies underneath it all, encoded within particular editing choices or background music. Just what can cailles en sarcophage tell us about gender and motherhood? Or, perhaps we can ask, what ties Thomas Keller's vision of ratatouille to New Objectivism? Don't worry if you have no idea what I'm talking about. Over the next few months, I'll pull out some food-related scenes from popular and not-so-popular television and films and break them down for you real nice and slow. You may think my analyses are crazy, but keep in mind that I'm sparing you my thesis on how Pokemon is pro-apartheid. Let's dive down into the rabbit hole together, shall we? I promise, it'll be as fun as a fistful of creamed corn! I know, French with Spanish subtitles. I explain what's happening below, don't worry. The Gleaners and I (2000) is a semi-autobiographical documentary by Agnes Varda, the fairy queen of the French New Wave movement. It follows her through the French countryside to Paris, where various people and communities — "glaneurs" — scrabble together food by scavenging through the debris of grocery stores, farms, and urban humanity. At the same time, Varda reflects on how she's aged over time, and illustrates this using techniques such as zooming in on the wrinkles of her hands with a hand-held digital camera. In the clip above, Varda begins the film as a novice, taking hints from a group of potato gleaners who depend on a local industrial farm's unwanted crops for sustenance. "Don't pick the green ones," they tell her. 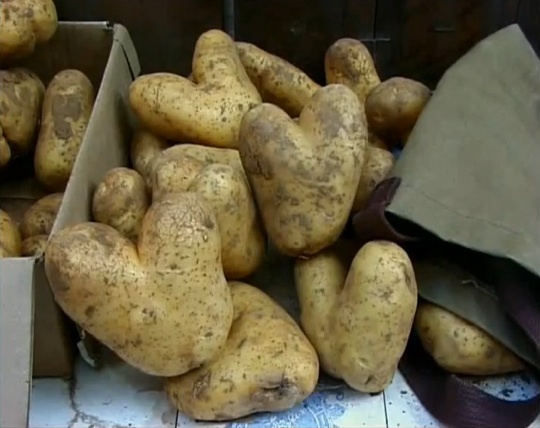 The farm dumps the potatoes that won't fit in at grocery stores: the over-large, the too-small, and the heart-shaped. Varda goes ga-ga over the potatoes, telling her fellow gleaners, "The heart, I want the heart!" She gathers up a bagful of them to bring home and films them as they sprout and rot away on her shelf. Varda uses the concept of gleaning to resuscitate waste, questioning the values that label it as such in the first place. By placing herself on the same level, she asks, "Well, can't an old woman be garbage, too?" Heart-shaped potatoes are surprisingly common, though their estrangement from mainstream consumption is fodder for some truly idiotic news stories. Whether or not our minds can tolerate the idea, not all potatoes are shaped like solid turds. Some are the size of a marble, while others look like medieval flails. When I first saw this film, I was working on a small-scale farm in Minnesota, and we just so happened to be harvesting potatoes that week. Every time one of my coworkers found a heart-shaped one, she would put it aside for our collection. What kind of people would throw these away? I didn't let mine rot, though; I made it into a couple of oven fries. What does that say about me? Yes, those were some truly idiotic news stories. I had no idea heart shaped potatoes were common - I can't understand why the food-powers-that-be of this nation insist on making sure all the food looks exactly the same (plastic/engineered). Are we really that pathetic as a country that we can't handle a little variety now and then? I haven't seen this film, but I found your analysis interesting. I'll have to put it on my Netflix queue. I wrote a post on my blog a few weeks ago about my belief that Rosemary's Baby is actually a food movie underneath all that son of Satan nonsense. I would love to read your take on it! Excellent column! Le Glaneurs is agreat movie, if at times a little odd. I suppose we all get a little wacky with old age! I wish I could find the clip where Agnes Varda walks in front of the camera to the empty clock. I love that you call Varda a GILF! You must have really been vibing off all those hand shots. It took me a while to figure out what a GILF was, and I am certain that it is not just you. Somewhere there is a website devoted to the topic. I am surprised, though, that odd-shaped potatoes are rejected. I would have expected that the producers would have packaged them as a specialty item, and sold them for about double the price. Who wouldn't want heart-shaped potatoes?